One of North America’s pioneer llama breeders, Great Northern has 60 llamas on its 240-acre ranch in northwest Montana near Glacier National Park. 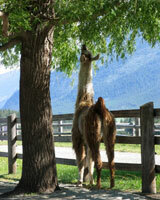 Our classic, silky and suri llamas are admired for combining athletic strength and stature with great beauty. We’re proud that our herd identifier, GNLC, is in the name and lineage of so many show winners, year after year, and that they enjoy great success in the sale ring, too. As one of America’s first commercial llama outfitter and guide services, we’re especially fond of our hard-working packers. In the great Andean mountaineering tradition, these faithful trail companions have carried all our gear on camping, fishing and hunting trips in Montana’s spectacular backcountry since 1979 when we introduced llamas to the Northern Rockies. Raising these wonderful animals has been our family’s full-time, hands-on business for over three decades. We’ve helped countless new breeders get started with practical, common-sense advice for enjoying a profitable and easily managed hobby or small business. In addition to breeding and show stock, we have pet, pack and guard llamas for sale, and we offer service to our outstanding herdsires. Give us a call any time!